Galactic Pegasus have been around for a while, 2 EPs back in 2012 and 2014, and now with their latest release the bar is up. They have built upon all their musical representation, the compositions are complex, Phanton Of The Hill possesses production quality that will make a lot of band jealous. All that work that has been done here affirms their presence in the heights of the djent and metal scene for sure. It is no surprise to anyone when a heavy band from the djent, metalcore or even deathcore genre starts using melodic vocals, the admirable approach is when it sounds mature (unlike Erra or Ghost Iris for example), it gives depth and helps the artist express more complex emotions and it is awesome we can find that in Phantom Of The Hill. It is great how Galactic Pegasus have managed to combine so many different musical patterns – brutal breakdowns, djenty chugs, clean vocals, growls and it still sounds right. I can comment on a couple of incomplete song endings, yes it is on purpose, it is ok, but not for a couple of songs, one could have been enough. On the other side, some songs feature major keys in the composition, which is quite uplifting, creating a nice feel. You can feel the vibe, that is such an admirable achievement of dynamics and composition, if music doesn’t deliver emotion, there is no way to get your message to the listener. The songs may not be that ultimately unique, some remind of other bands somehow, but that is no spoil at all, as Galactic Pegasus still succeeds to deliver awesome musical art. Phantom Of The Hill is extremely technical and good sounding, those melodic lines and how they transform into brutal breakdowns is well thought and when the album is harsh sounding it kicks buts, a festival of the deathcore inspired chugs, but when the melody kicks in, it is a bliss. Oh well, the sound is good, the production is an absolute blast. Guitars are gorgeously crisp and all those ambient layers with clean riffs in the back really let you dig the emotional capacity of each song. As a guitarist I want to comment on the chugs and their overall master score, well what I like is that the guitars are not extremely sharp sounding and the gain is a little bit lowered, but the punch is there, that is nice, overall the production of the strings personally reminds me of Veil Of Maya. The melodic scale gallops are very clean, they sound well. They have achieved a djent tone, that is not quite common lately, sweet. A good production is nothing without well mastered bass and drums and here you got it, deep, well sounding bass, buffed nice drums, the levels are balanced, so all the accompanying assets are easy to hear and you can grasp everything. Galactic Pegasus have put a lot in the vocal work, the growls are brutally nice and the cleans are just a bliss to listen to. While there are not many industrial elements, in Phantom Of The Hill their usage is balanced. 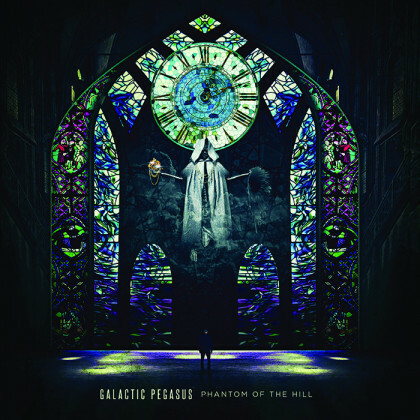 Overall that album is more than satisfying, it is Galactic Pegasus‘ ticket to the big stage, Phantom Of The Hill is a breakthrough release, right on, lads!